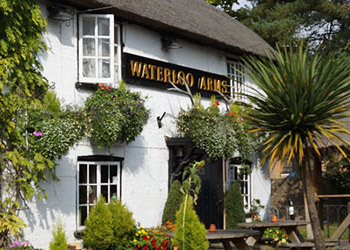 Description: Once a 17th century water-mill, the hotel boasts an idyllic and tranquil riverside location. Enjoy excellent cuisine in the informal atmosphere of the restaurant, which overlooks the fabulous gardens. Ideally situated for all New Forest attractions. Description: The Grapes still has the all important traditional feel of a proper boozer but with a modern twist. The pool table, live music and big screens contribute to the popularity of the venue and the friendly atmosphere and efficient staff. Description: The Three Tuns is an award-winning traditional 17th century inn with huge acclaim for its excellent AA and Egon Ronay recognised food & drink. Description: A 17th century thatched roof pub and restaurant in Lyndhurst, just off the A337, offering a wide selection of traditional home cooked food. Separate non-smoking areas and a delightful beer garden for families to enjoy. Description: The Fallen Tree Resaturant is run by three people. The food is prepared and served freshly every day. The chefs in the kitchen are using local products. Seasonal menu and very good selection of wines. We are open 6 days a week closed on Wednesday. Description: AA 2 star hotel & restaurant on the north east edge of the new forest comprising 14 en-suite bedrooms, bar & restaurant & small conference/meeting facilities.